Thanks for another great Wednesday at the New Albany Farmer’s Market, it was a hot miserable day but you all still came out to support your local vendors. We appreciate each of you for that! We have great produce available at the market this weekend! 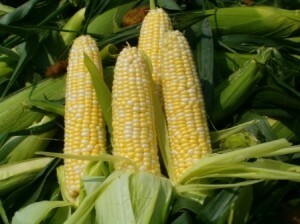 The first SWEET CORN of the season is here! Hopefully we will have much more this season, but we need rain! It is wonderful right now, don’t miss out, you’ll want some for your weekend cookouts. Kenny has been digging more garlic this week, we will have more available, both “elephant” and “French”. We will also have some of our first eggplant this season, Kenny has seven different varieties planted this year. Tomatoes are just getting better and better, we will have plenty of them and some cherry tomatoes as well as a few heirlooms. Along with these veggies we will also have new red potatoes, green beans, Swiss chard, beets, cabbage, green peppers, cucumbers, our new crop of “candy” onions and cauliflower(it will be the much smaller variety). English peas are still hanging in there so we should have a few of them and a few kohlrabi available. We still have some blueberries this Saturday and have started picking the first peaches of the season. Of course these are not the free stone variety, but they are delicious. Kenny picked the first blackberries this week as well, we hope to have some ready for the weekend.